Miroslav Popov's Expert Advisor Studio is a new and unique tool that creates a single Expert Advisor that can include up to 100 optimized and backtested, individual strategies. This collection of strategies in a single MQ4 file is referred to as a Portfolio Expert Advisor. Each strategy within the Portfolio Expert Advisor is assigned a unique Magic Number. Whereas previously our time and effort was spent on developing one (or a few) profitable EAs, with Popov's tool we now have a new problem -- how to manage portfolios that include 100's of EAs (most profitable, but some not so profitable). What a great problem to have!! 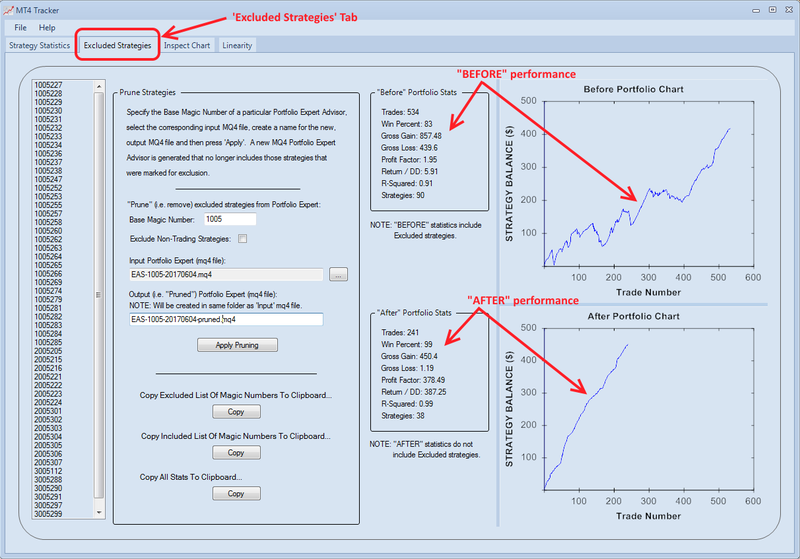 MT4 Tracker is a Windows application that can be used to refine and optimize a portfolio of EAs. It was developed to complement Popov's software that generates large collections of profitable EAs that can either be attached individually to their own MT4 chart or combined into a single Portfolio Expert that is attached to a single MT4 chart. As your portfolio of strategies grows then it becomes more difficult to keep track of their individual performances. 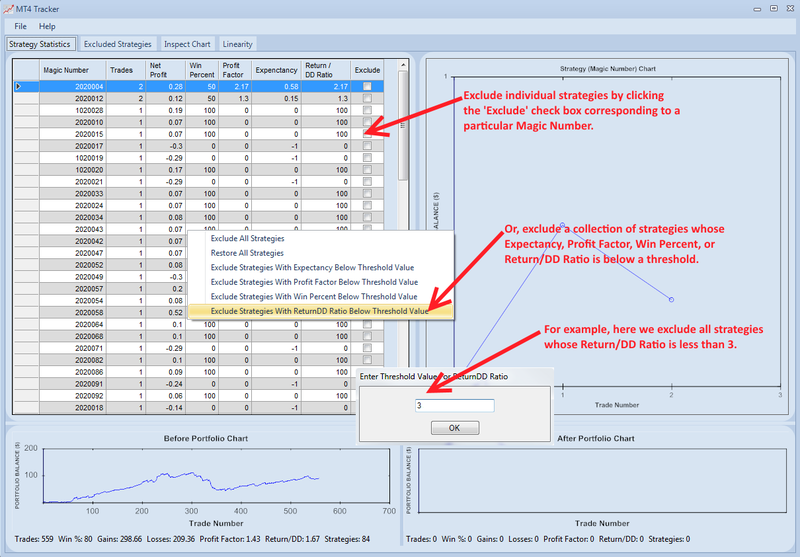 MT4 Tracker not only includes a number of features that save time, but it also provides unique views into how your strategies are performing -- so you can make better decisions. And at a cost of only $49 USD, the tool pays for itself the first time it identifies a poor-performing strategy. For help with using MT4 Tracker, please refer to the online documentation. 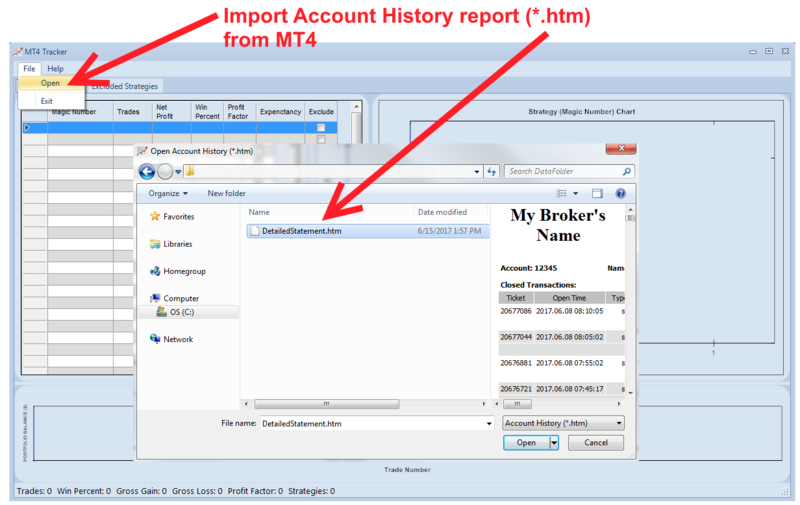 To begin using MT4 Tracker the Account History report (*.HTM) is exported from MT4 and then imported into MT4 Tracker. 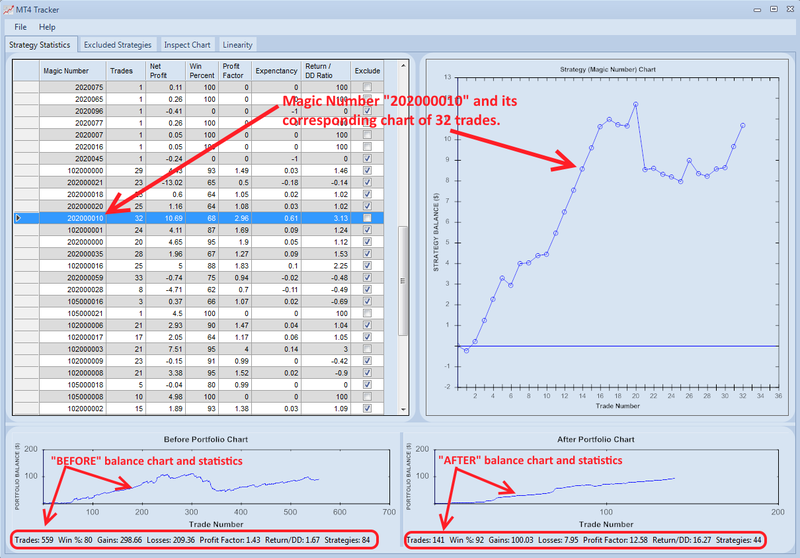 MT4 Tracker reads and parses the Account History and then populates its Table View, which shows all your trades, along with their corresponding Magic Numbers. The Table View shows all the trades imported from the MT4 Account History report. 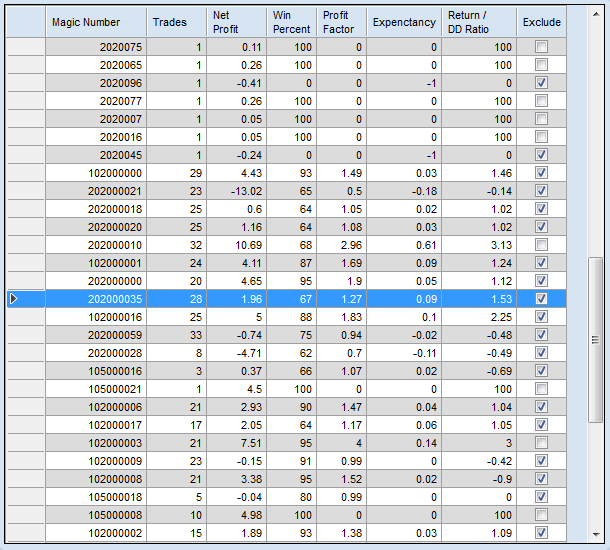 Each row in the table represents a single strategy and summarizes its trading results by displaying: Magic Number, Number of Trades, Net Profit, Win Percent, Profit Factor and Expectancy statistic. The last column in the table, Exclude, is used to mark the strategy for removal or "pruning" (more on this later). One of the most useful features of MT4 Tracker is that it gives you the ability to exclude certain strategies and then recalculates the account's performance. In this way -- that is, by comparing the account's performance with / with out certain strategies -- then you can decide which strategies to remove from your portfolio going forward. The image below shows a couple of ways to exclude strategies. One way is to scroll down the Table View and select each strategy, one-by-one, and view its performance chart. If you don't like its performance then click the 'Exclude' checkbox corresponding to that strategy. A second way is to right-click inside the Table View and a pop-up menu will appear with a few options -- e.g. exclude a collection of strategies whose Expectancy, Profit Factor, Win Percent or Return/DD Ratio is below a threshold value that you specify. In the example below we show the balance chart for the portfolio "Before" and "After" excluding those strategies whose Return/DD Ratio is < 3. If you examine the statistics for the portfolio as a whole, you can see the improvement can be fairly dramatic when poor-performing strategies are removed. 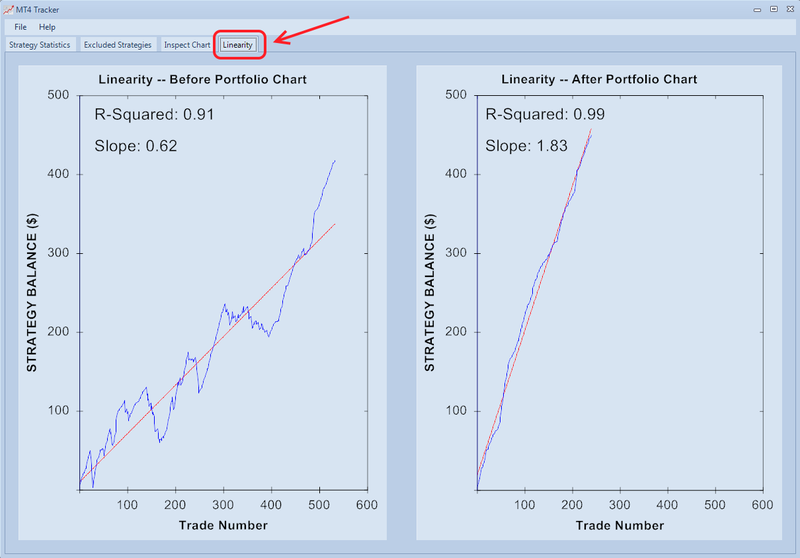 The next feature we will briefly describe here is MT4 Tracker's ability to take a Portfolio Expert MQ4 input file, remove (or "prune") those strategies that have been marked for exclusion, and then regenerate a new Portfolio Expert MQ4 output file. This feature is accessed by selecting the "Excluded Strategies" tab. Please note that this feature only applies to EA Studio's Portfolio Experts. Along the left-hand side is the list of strategies (i.e. Magic Numbers) that have been marked to be excluded. The "Before" and "After" stats and charts are also shown. To actually make the changes you will need to enter 3 pieces of information and then press the 'Apply' button. The 3 pieces of information are: Base Magic Number, Input Portfolio Expert (MQ4) filename, and Output Portfolio Expert (MQ4) filename. The chart below shows the result of substituting the original Portfolio Expert with a "pruned" one. This is a live "micro" account. At around trade #58 the original Portfolio Expert was replaced with a new "pruned" version where excluded strategies had been removed. 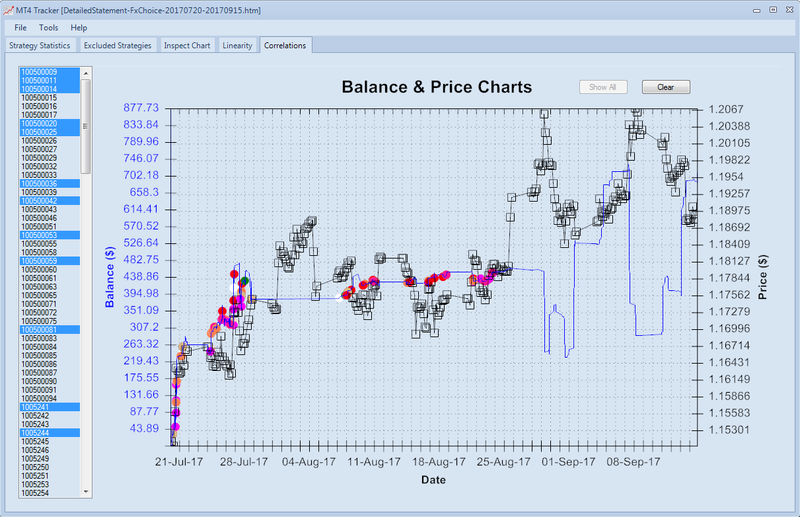 The next feature to point out is MT4 Tracker's ability to traverse up and down the chart in finer detail. This can help identify which strategies caused significant dips in the balance chart. 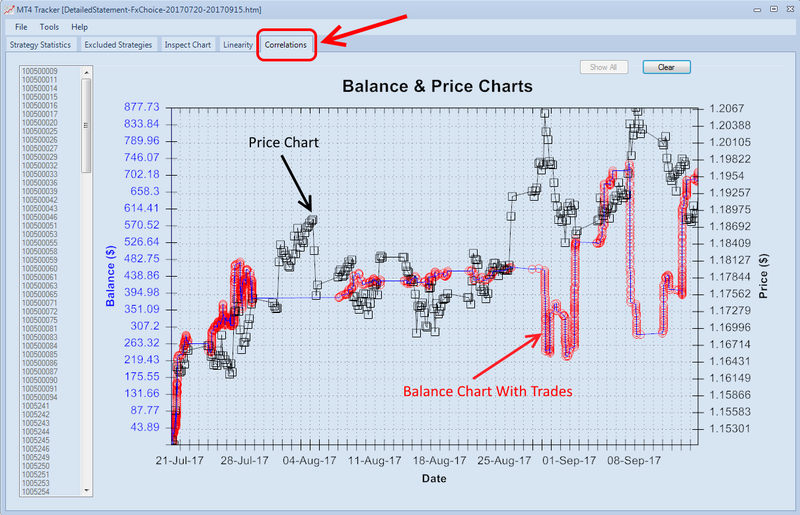 The next feature are the "linearity" charts that are computed for both the "BEFORE" and "AFTER" portfolio balance charts. How one interprets a portfolio's balance chart is somewhat subjective, though we do place importance on linearity as a measure of how robust a portofolio's trading behavior is. Obviously we can't predict the future, but the more linear the balance chart is then the more confidence we have it will continue to perform following the same pattern. And the last feature we'll briefly describe here are the "correlation" charts. Here the balance (blue) and price (black) charts are overlaid. 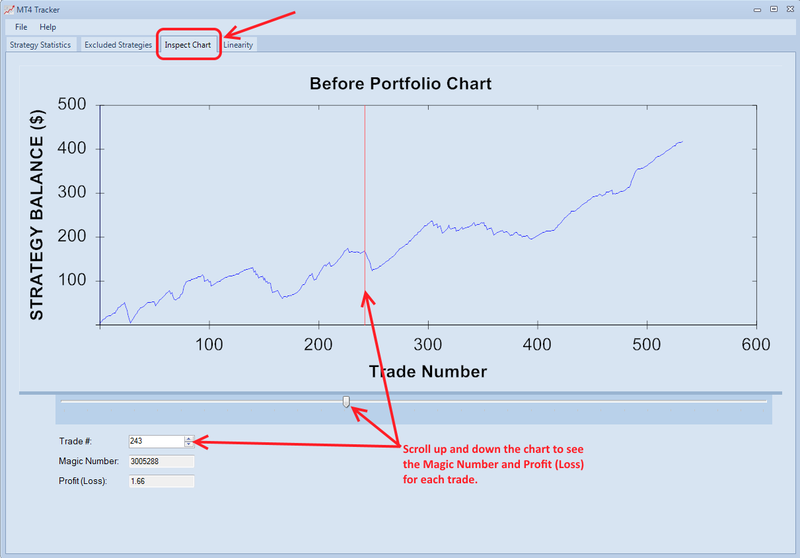 In addition, markers can be added to show the trades for one or more strategies. In this way we can (a) determine whether there is any correlation between strategies in terms of their trading patterns, and (b) better see how our strategies and portfolio performs during different market conditions -- e.g. trending up, trending down, ranging, etc. For more detailed instructions on how to use MT4 Tracker please refer to the online documentation.